In just 1 minute you can perform at production line the analysis of Free Fatty Acids (FFA) value in edible oils and fats using innovative CDR FoodLab® method that simplifies and speeds up the AOCS Official Method Ca 5a- 40 procedure with the same accuracy. low toxicity reagents previaled in micro quantity and ready to use remove the need to handle toxic or carcinogenic compounds. Results are comparable to the ISO/AOCS method with very high correlation coefficients. high accuracy and sensitivity: up to 0.01% deviation in oleic acid can be detected. test using micro-samples: suitable even to test fat substances that have a difficult extraction process. The calibration curve of the analytical CDR FoodLab® method, carried out with respect to the reference method AOCS Official Method Ca 5a-40. 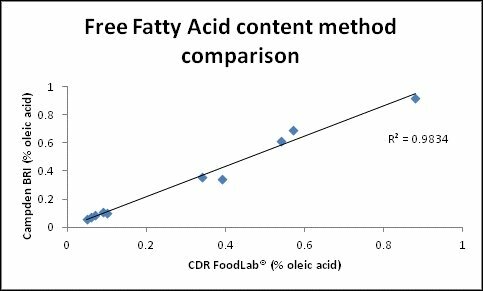 Furthermore Free Fatty Acids content was determined using the CDR FoodLab® instrument and the titration method used by Campden BRI (Campden BRI Method TES-AC-211): the data for Free Fatty Acids using the CDR FoodLab® was found to be very consistent with good reproducibility across the triplicate runs, and the correlation is very good. Testing time: one test 1 minute – 80 Tests/hour. Free fatty acids of the sample, at pH<7.0, react with a chromogenous compound and decrease its color. The decreasing of color, read at 630 nm, is proportional to the acid concentration of the sample, expressed as % of oleic acid. The acid content of edible fats is given by the quantity of free fatty acids deriving from the hydrolytic rancidity of triglycerides. As this alteration occurs in unsuitable conditions for the processing and preservation of fats, acidity represents a basic indicator of the genuineness of the product. The test is particularly important during the refining of oils and fats, for the assessment of the processing cycle and for the definition of product categories. Specific curves suitable for the analyzers CDR FoodLab® for oils and fats. The curves 10 µL e 5µL are mainly recommended for refined oils with very low acidity, requiring great precision to values lower than 0.5. The curve 2.5 µL is very accurate over the whole range and can be used for refined oils and non-refined with acidity below 1.1. The other ones are recommended only for oils with high levels of acidity. The curve 5µL is the same for the analysis of fats, but in this case it is necessary to make a small sample treatment . Specific curves suitable for the analyzer CDR FoodLab® for nuts. Specific curves suitable for the analyzers CDR FoodLab® for fats and oils. Curve primarily applicable in the control of Biodiesel and fuel oils, requiring the expression of the result in Acid Aalue. Free Fatty Acids was last modified: March 6th, 2019 by CDR s.r.l.